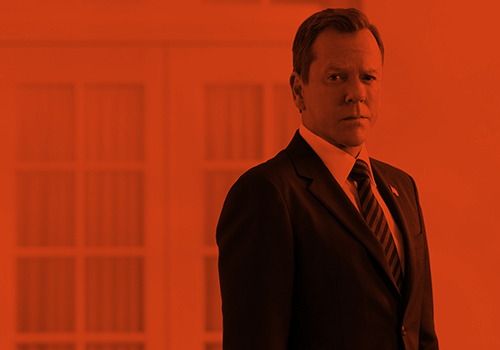 Kiefer Sutherland wanted to kill off “24’s” Jack Bauer, but Fox dramatically staged an intervention to keep the icon alive. Gordon said Sutherland’s desire to kill Bauer was inspired by the actor’s ambition to “do something different,” but also his somewhat “self-destructive personality.” But he added, “We were ready to move on. We all felt that character’s story has been told.” The last season saw Bauer hand himself over to the terrorists. Multiple Emmy-winning TV writer and producer Gordon spoke at a 21st Century Fox luncheon at the Cannes Lions festival hosted by executive chairmen Rupert and Lachlan Murdoch. He discussed the spinoff “24: Legacy” that won’t star Sutherland — instead Corey Hawkins headlines as Bauer’s CTU successor — but said he hopes Jack Bauer could make a cameo. “There’s always a chance he could come back.” Fox green-lit the series in April with a 12-episode order. He added, “When ‘Homeland’ came, at the end of ’24’ … I realized there was no soldier represented on television who had come home from war, so that was the genesis of that. Sorry for the lack of updates lately! I’ve finally updated the gallery with Kiefer’s public appearances from this year. Hope y’all enjoy! Home > 24 > 24: Live Another Day (2014) > Episode Captures > 8:00 P.M. – 9:00 P.M.
Home > 24 > 24: Live Another Day (2014) > Episode Captures > 9:00 P.M. – 10:00 P.M.
Home > 24 > 24: Live Another Day (2014) > Episode Captures > 10:00 P.M. – 11:00 A.M. If you haven’t noticed, I also just finished putting up a new theme here at the site, and the gallery as well. I used some of the photos from Kiefer’s photoshoot for Esquire this last July. I am so very sorry for the lack of updates lately, I have been very busy the past couple of months getting things ready around the house for our big move. My husband is now a recruiter in the U.S. Army and we just moved back home to Wisconsin! We haven’t moved in to our new place yet, as there’s lovely hoops to jump through to buy a house, but we will be moving in later this month! I finally have some time and decent (sorta) internet access, so I’ve updated the gallery with episode stills from the season finale of 24: Live Another Day. They are only Kiefer photos, as this site is dedicated to Kiefer and not 24; if you are interested in finding caps or stills from the entire episode, check out Screencapped.net‘s 24 Gallery, which I staff 🙂 The missing screencaptures will be added sometime this week as well. Home > 24 > 24: Live Another Day (2014) > Episode Stills > 10:00 P.M. – 11:00 A.M.